Shared mobility is currently regarded as one of the most important topics in the automobile industry. Like all future urban mobility concepts, it requires close integration with social future research. For new vehicle car sharing concepts, recording all factors that involve costs and analyzing them in regards to their influence on cost effectiveness and vehicle construction is critical. 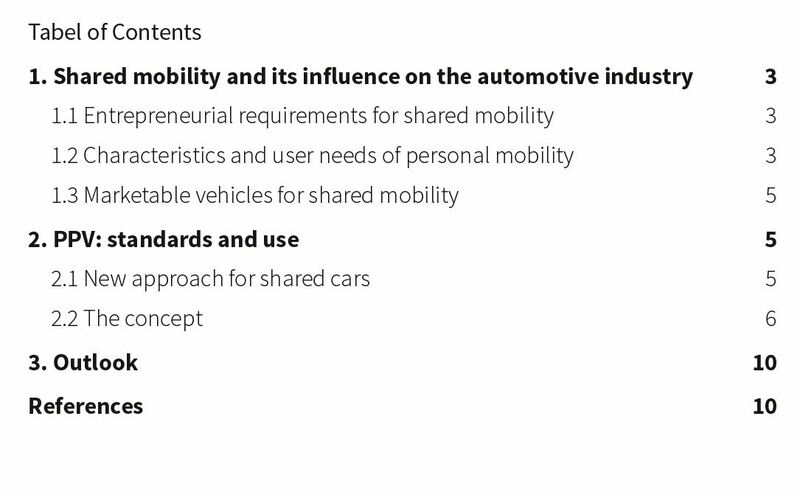 In accordance with this approach, FEV, the Aachen University of Applied Sciences, and share2drive provide an outlook on the future vehicle classes of personal public vehicles (PPV) as a means of transportation and an interface between public and personal transportation. Please fill in your personal information and submit the form to receive the entire whitepaper. SVEN is a pure electric vehicle designed for urban shared mobility, especially carsharing and fleets. It is a small, compact car that fits in almost every parking space in cities. SVEN is agile and characterized by high crash safety. As a “rolling device” SVEN is fully connected to the internet and allows user-specific settings.